The saga continues – and no, this isn’t a movie. This month, the EPA released its final assessment of the proposed Pebble Mine in Bristol Bay, Alaska (and it’s a damning assessment at that!). The report concluded that Pebble Mine could destroy up to 94 miles of streams where the salmon spawn and migrate – and 5,350 acres of wetlands, ponds, and lakes. The science is clear: mining and salmon do not mix. We’ve been following this story, and engaging with the movement to stop Pebble Mine, for years. And we’re thrilled to report that the steady pressure from chefs and food professionals raising their collective voice to say no to Pebble Mine has been critical. It helps lawmakers do the right thing. Thank you. Last week, a rally also went down in Seattle, WA to keep the pressure on stopping Pebble Mine. 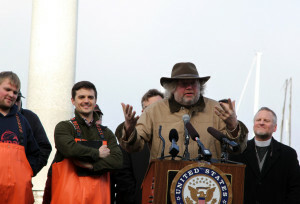 On January 23, Washington Senator Maria Cantwell and more than 250 chefs and food professionals – including Tom Douglas – stood together to demand that the Obama administration prevent Pebble Mine from destroying Bristol Bay, Alaska. The rally brought together “salmon fishermen and their families, mechanics and engineers who build parts for the fishing boats that travel north to Alaska each summer, Native American tribe members from southern Alaska and around Seattle, environmental activists, salmon processors and food distributors, patrons of restaurants and consumers who have eaten and loved salmon, and of course… Tom Douglas.” (excerpt from TomDouglas.com.) Participants spoke about why Pebble Mine would affect them, and their families and work. You can read more about the rally on Tom’s blog here. This rally could not come at a critical time. For while we can feel good knowing the EPA is well aware of the negative impacts of Pebble Mine, the fate of Bristol Bay is far from secure. Until the final ruling is made, it is more important than ever that we keep steady pressure on our lawmakers, and the Obama administration, to prevent Pebble Mine from destroying the pristine waters of Bristol Bay.